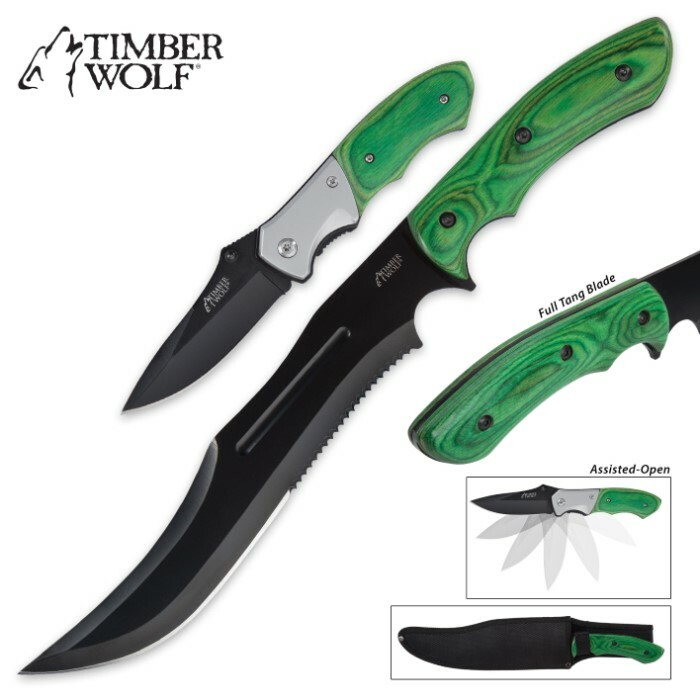 Timber Wolf Mossland 2-Piece Fixed Blade and Pocket Knife Set with Sheath - Green | BUDK.com - Knives & Swords At The Lowest Prices! Like untamed predatory woodbeasts, the knives in Timber Wolf's 2-Piece Mossland Set are truly wild - unapologetically savage, exceptionally tough and able to effectively adapt to countless situational and environmental changes, no matter how rapid or sudden. Both the folder and fixed blade knife are engineered for strength, cutting potency and resilience, boasting robust stainless steel blades enhanced with a stylish and discreet nonreflective black coating. 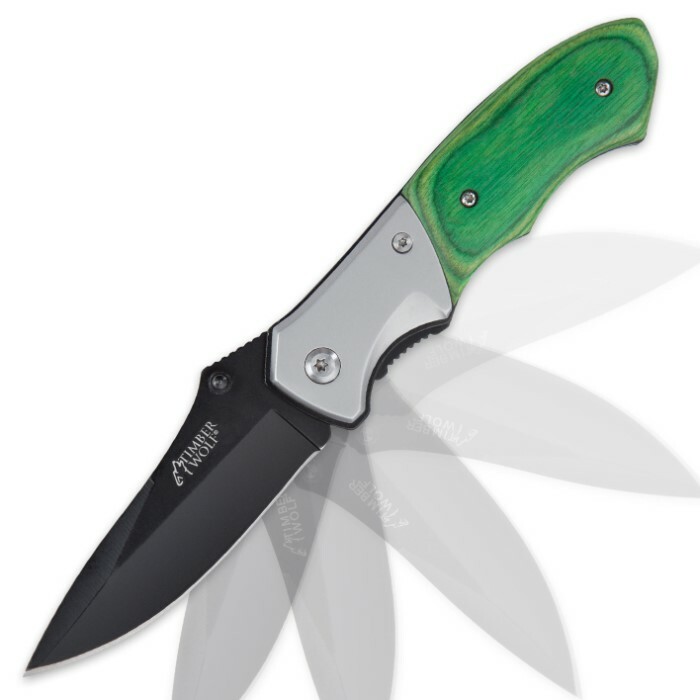 The brooding matte black blade finish is offset smartly by the forest green-stained pakkawood handles. Vibrant but not brash, the handsome emerald hue beautifully highlights the pakkawood's delicate natural grain patterns. At 14 3/4" long, the Mossland Fixed Blade is powerful and imposing. Despite its impressive size, however, this bowie is remarkably easy to manipulate and an all-around pleasure to wield, thanks to its streamlined form, generous finger choils, ergonomic handle contours and superb balance and weight distribution. The blade is 9 3/8" long and an all-around workhorse, with its unique, versatile profile and two distinct edges - a razor sharp fine edge and rugged serrated edge that, together, are capable of tackling practically any job you throw at it. The Mossland Fixed Blade includes a heavy duty nylon belt sheath for easy transport and protection from the elements. As great as this beast of a bowie is, many tasks are better served by a gentler, finer touch, and the Mossland Pocket Knife has you covered. An ideal everyday carry, it features a 3 1/4" drop point blade with thumb studs for fast, easy deployment and a sturdy liner lock. 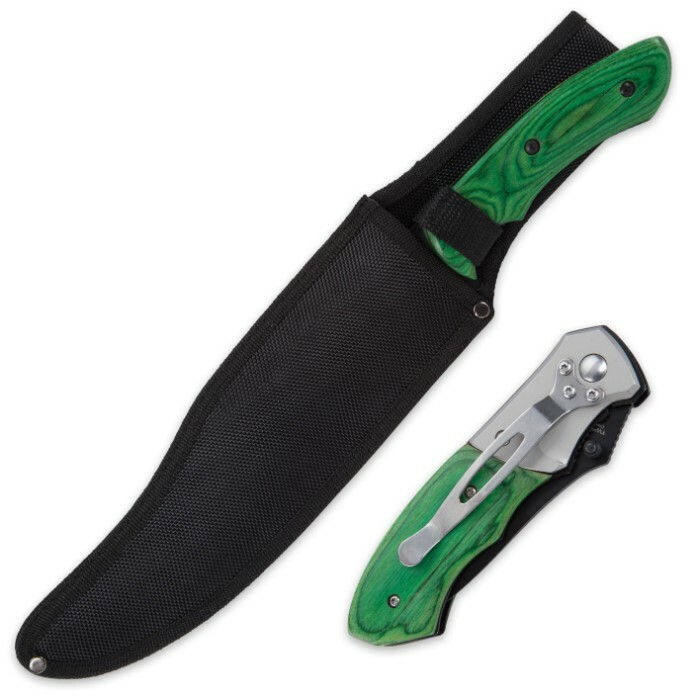 As with the fixed blade, the folder's green pakkawood handle scales yield a terrific hand-feel, while the built-in pocket clip allows for convenient, secure carriage. No matter the chore, no matter the location, no matter the conditions, Timber Wolf's Mossland 2-Piece Fixed and Pocket Knife Set is up to the job. Why take on the wild with one beast, when you can charge forth with two? On Pocket Knife I had to operate blade lots to loosen up for easy opening, recommend doing so carefully to become proficient at doing so with one hand. Nice weight to pocket knife, a sturdy carry along I consider well built. Long Blade. Some one was thinking when they designed this blade, balance point very slightly forward of handle ideally placed, design of blade makes it a very multi purpose, solidly built. Workmanship excellent on both knives. Exactly as advertised. Both knives and sheath nice for the money, I was not at all disappointed, FULL TANG 14 and 3/4" knife should do what it is designed to do.